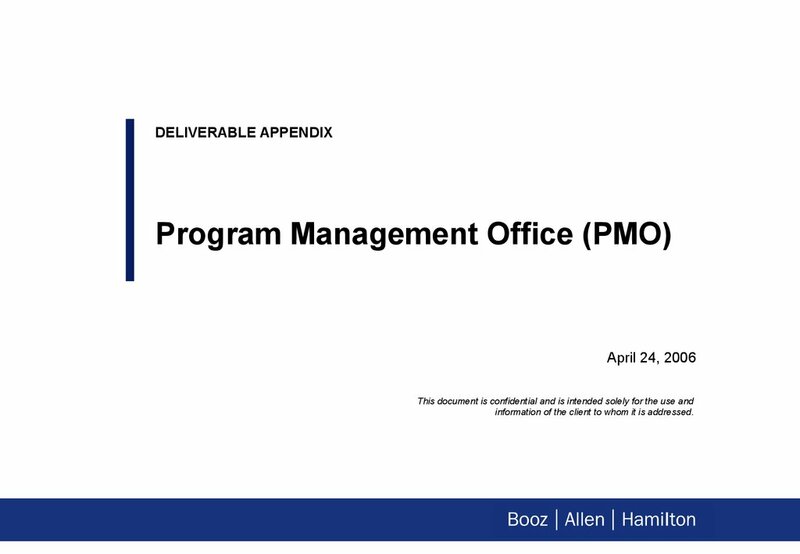 1 April 24, 2006 DELIVERABLE APPENDIX Program Management Office (PMO) This document is confidential and is intended solely for the use and information of the client to whom it is addressed.2 Program Management Office (PMO) Design3 Most large-scale transformation programs do not succeed, mainly driven by inadequate governance and poor planning Why Projects / Programs Fail Others Technical Problems Problems with Suppliers Ineffective Project Planning Poorly Defined or Missing Project Objectives Poor Organization and Project Management Practices Insufficient Project Personnel Resources Source: Standish Group International, Survey from 2500 personnel attending project management training Cancelled Under Perform Successful Large Programs Success Rates53%31%16%4 Examples of Challenges Project mission and tasks are poorly defined Lack of a clear process for escalating risks to senior management Insufficient reporting to support top-management decisions Ineffective enforcement of project controls and policies Conflict between line, project managers Projects do not meet deadlines / milestones Lack of standardized reports and reporting frameworks for all projects - Fragmented project plans Project mission and tasks are poorly defined Lack of a clear process for escalating risks to senior management Insufficient reporting to support top-management decisions Ineffective enforcement of project controls and policies Conflict between line, project managers Projects do not meet deadlines / milestones Lack of standardized reports and reporting frameworks for all projects - Fragmented project plans Benefits of PMO Identifies gaps in realization of strategic objectives Escalates current risks and identifies potential risks earlier Ensures proper communications to relevant stakeholders Improves monitoring and control of projects Mediates issue resolution Increases efficiency in tracking progress of projects Integrates project plans for all projects – Standardizes progress reporting Identifies gaps in realization of strategic objectives Escalates current risks and identifies potential risks earlier Ensures proper communications to relevant stakeholders Improves monitoring and control of projects Mediates issue resolution Increases efficiency in tracking progress of projects Integrates project plans for all projects – Standardizes progress reporting A Program Management Office (PMO) for telework initiatives can effectively help address these challenges… PMO Challenges & Benefits5 …and can accelerate progress, increase value, and reduce risk of failure Traditional Program Management Value 1: Accelerates Progress Value ($) Time Value 2: Delivers Incremental Value FailureFailure Efficient Program Management Office Implementation Planning & Set-up Assessment & Concept Development Validation& Detailing, Planning Value 3: Reduces Risk of Failure Value of an Effective & Efficient PMO6 3. 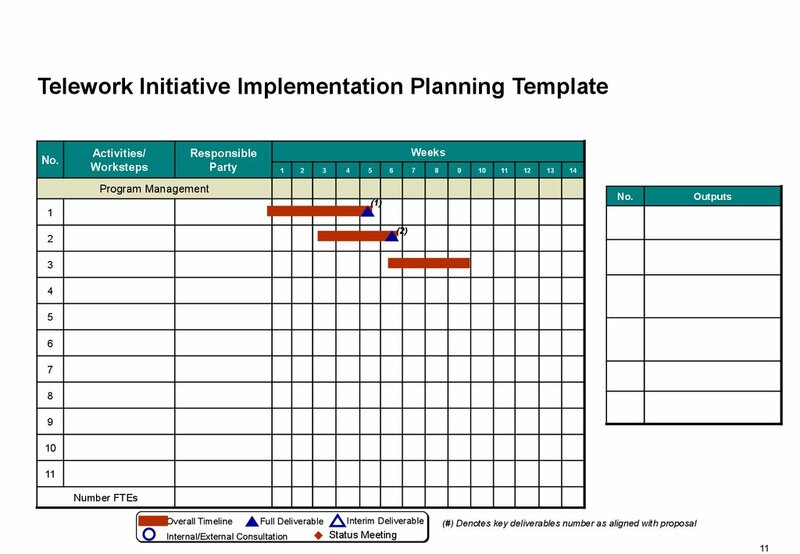 Prepare tools, processes and templates: Prepare all required tools, processes and templates Distribute templates and reports for PMO meetings Prepare project reporting, issue management, change management, and planning and communication management processes 1. 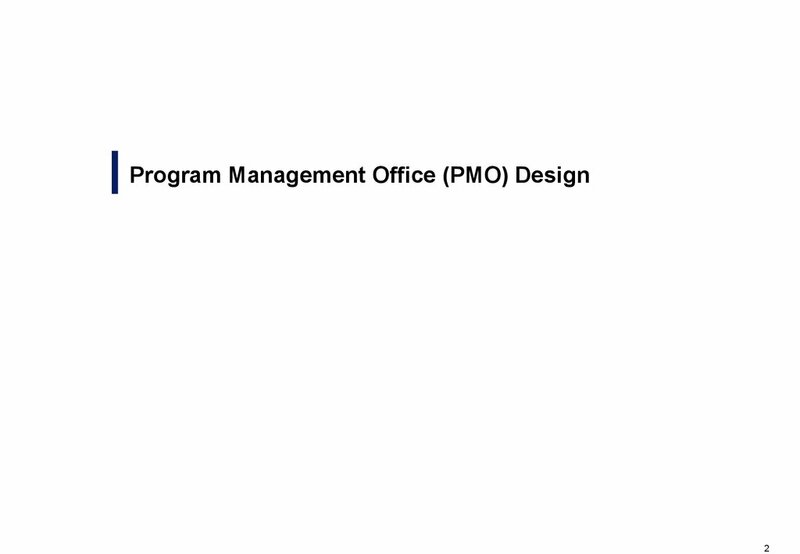 Nominate and confirm PMO team: Identify, nominate and obtain approval for the PMO leadership from senior management 2. 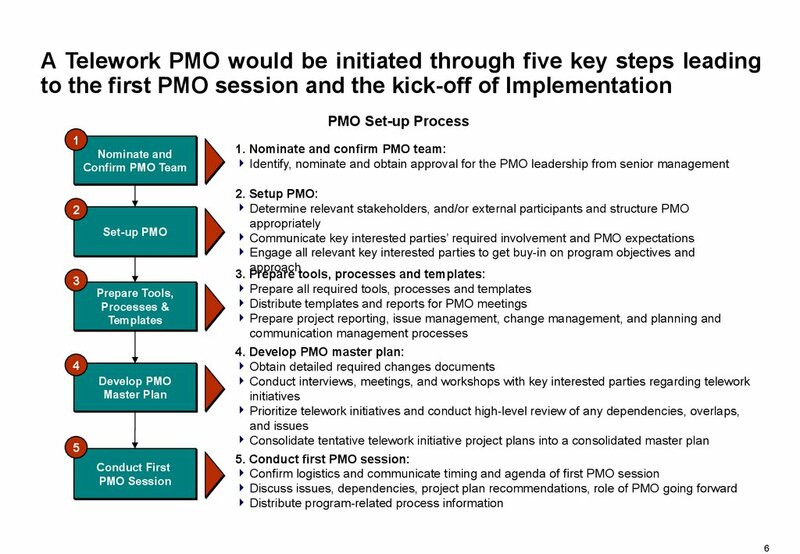 Setup PMO: Determine relevant stakeholders, and/or external participants and structure PMO appropriately Communicate key interested parties’ required involvement and PMO expectations Engage all relevant key interested parties to get buy-in on program objectives and approach 4. 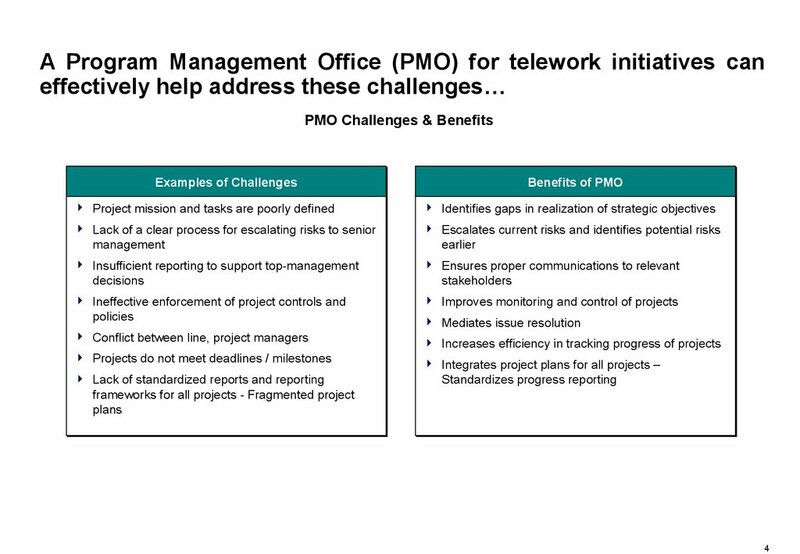 Develop PMO master plan: Obtain detailed required changes documents Conduct interviews, meetings, and workshops with key interested parties regarding telework initiatives Prioritize telework initiatives and conduct high-level review of any dependencies, overlaps, and issues Consolidate tentative telework initiative project plans into a consolidated master plan 5. 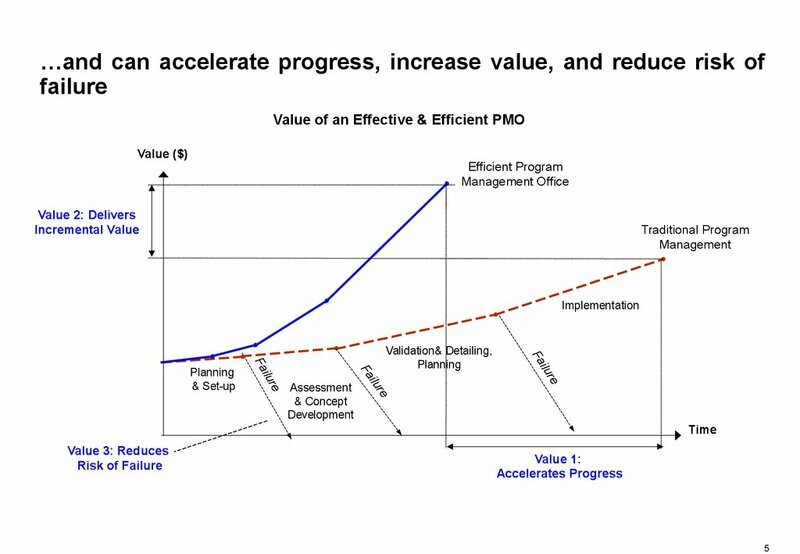 Conduct first PMO session: Confirm logistics and communicate timing and agenda of first PMO session Discuss issues, dependencies, project plan recommendations, role of PMO going forward Distribute program-related process information Prepare Tools, Processes & Templates Prepare Tools, Processes & Templates Develop PMO Master Plan Develop PMO Master Plan Nominate and Confirm PMO Team Nominate and Confirm PMO Team Set-up PMO1324 Conduct First PMO Session Conduct First PMO Session5 PMO Set-up Process A Telework PMO would be initiated through five key steps leading to the first PMO session and the kick-off of Implementation7 Preliminary Suggested PMO Structure Program Sponsorship Oversight and direction Institutional commitment to program Project Management Day-to-day project management IT, Business and Vendor representatives (full-time involvement) Program Management Overall responsibility program implementation and related efforts Conflict resolution Communication with key external interested parties Workgroups Technical and operational business initiative solutions The PMO must be comprised of senior people to facilitate and govern the implementation process TENTATIVETENTATIVE Workgroups PMO Chairman Program Management Office Business Officers IT Officers Change Officers HR Mobilization Changes and Transformation Changes and Transformation Core Functions Support Functions I/T, Vendors, etc. 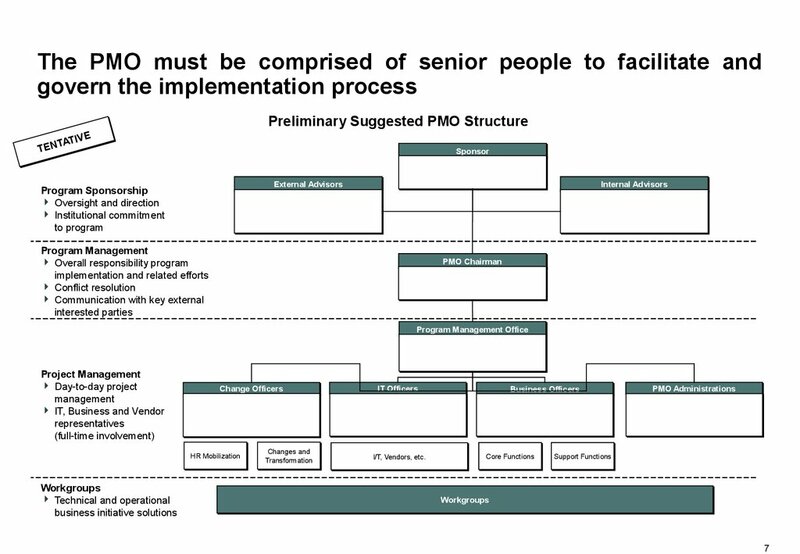 PMO Administrations External Advisors Internal Advisors Sponsor8 High-Level LTO PMO Functions1. 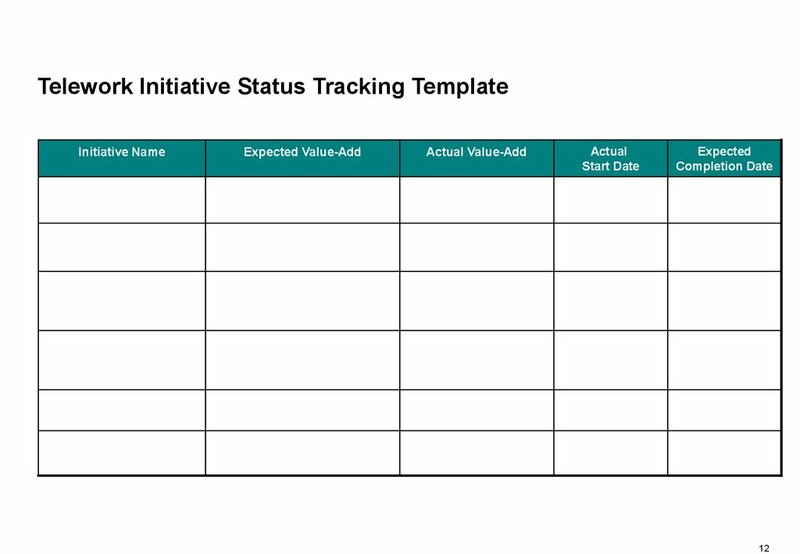 Progress Tracking and Reporting : Track milestones and deliverables for each project:– Reject project plans if they do not conform with PMO standards and required level of details– Identify and coordinate program critical path changes throughout telework projects2. Communication Management : Communicate relevant messages to all key interested parties3. Resource Management : Identify potential resource bottlenecks, unique requirements, contingencies and plan accordingly4. Issue Management : Establish and maintain standards for issue categorization and resolution according to issue severity and facilitate resolution5. Risk Management : Pro-actively identify and quantify potential risks (e.g., financial, resource, technical) Establish and maintain quality assurance standards, procedures and schedule compliance / assurance reviews6. 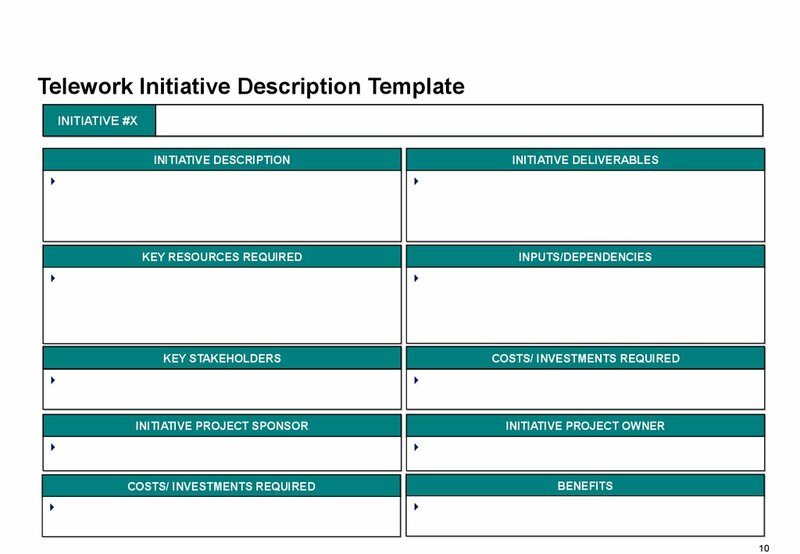 Quality Assurance: Provide criteria in selecting contractors during the RFP process7. 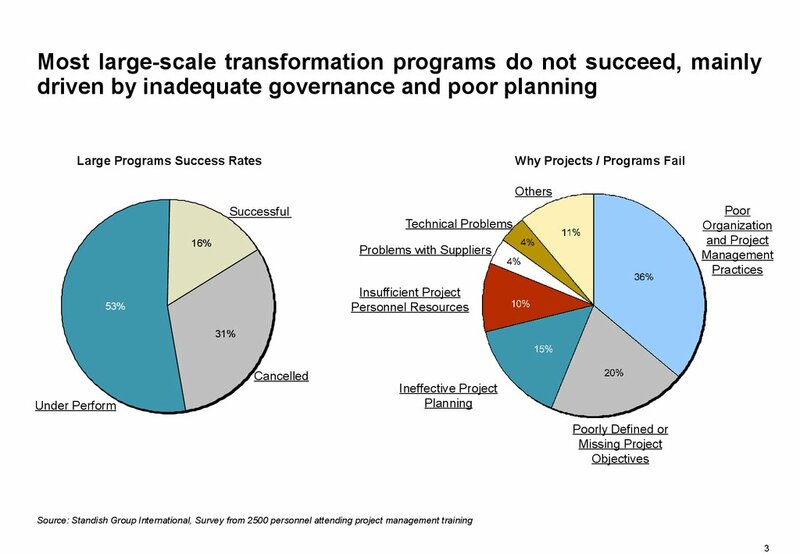 Change Management: Establish and maintain a standard process for receiving, testing and approving changes to program scope8. 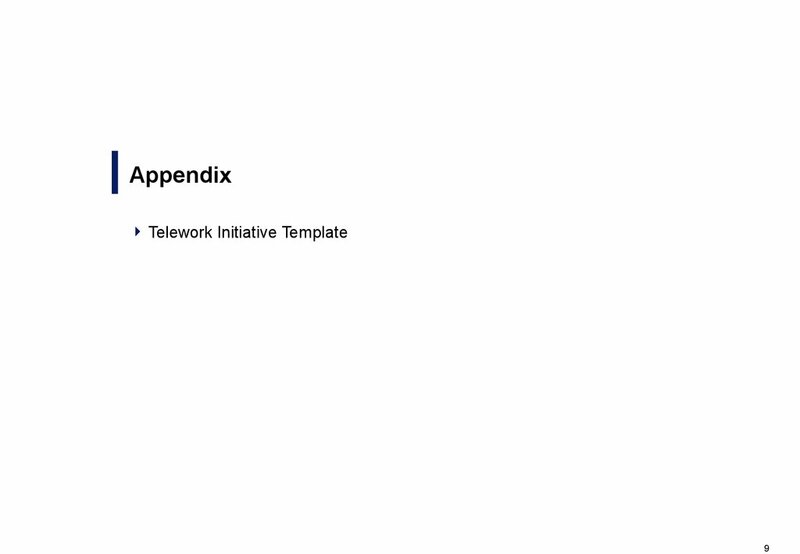 Business Alignment: Assess the fit and identify gaps between business needs and processes with the proposed solution9. Technology Alignment: Assess the fit of proposed technologies with current or planned environment / infrastructure1. 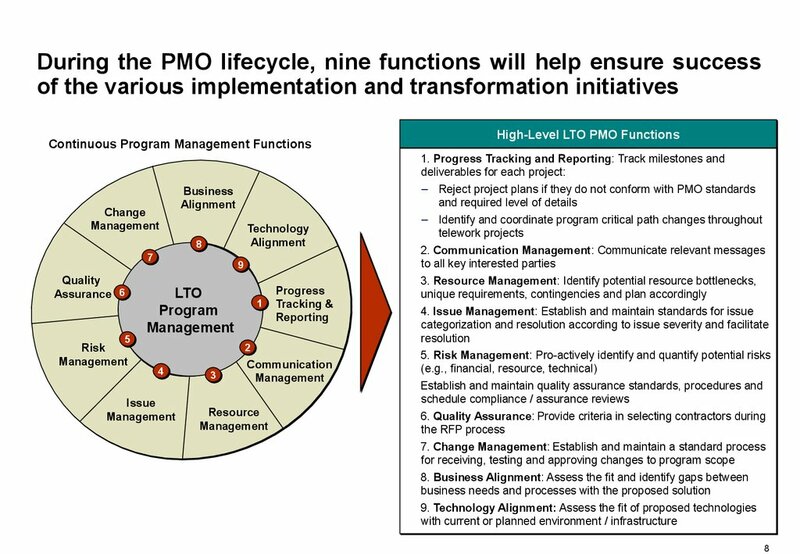 Technology Alignment: Assess the fit of proposed technologies with current or planned environment / infrastructure Continuous Program Management Functions Progress Tracking & Reporting Technology Alignment Communication Management Issue Management Risk Management Change ManagementLTO Program Management Quality Assurance Resource Management Business Alignment123456789 During the PMO lifecycle, nine functions will help ensure success of the various implementation and transformation initiatives9 Appendix Telework Initiative Template10 INITIATIVE #X INITIATIVE DESCRIPTION INITIATIVE DESCRIPTION INITIATIVE PROJECT SPONSOR INITIATIVE PROJECT SPONSOR KEY RESOURCES REQUIRED INPUTS/DEPENDENCIES COSTS/ INVESTMENTS REQUIRED INITIATIVE DELIVERABLES INITIATIVE DELIVERABLES INITIATIVE PROJECT OWNER INITIATIVE PROJECT OWNER KEY STAKEHOLDERS Telework Initiative Description Template COSTS/ INVESTMENTS REQUIRED BENEFITS 11 Telework Initiative Implementation Planning Template Number FTEs Responsible Party111098765432891011121314 Activities/ Worksteps Program Management17654321 WeeksNo.